Pie Dough for a 9″ tart , store bought or homemade works fine (click the link to my Lemon Meringue Pie which includes the plain and perfect pie crust recipe and how-to). Preheat oven to 400 degrees. Roll the pie dough out large enough to fit the tart pan (or pie pan if that’s what you have), and line the pan with the dough. Poke the dough all over the bottom and sides with the tines of a fork, gently please…don’t take out your aggressions on this lovely tart dough. 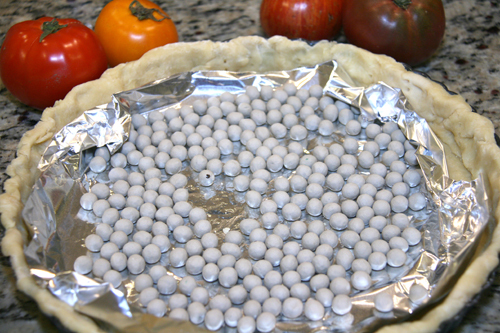 Cover the dough with parchment paper or aluminum foil and place pie weights, raw beans or raw rice inside (to weight the pastry down). Place the tart pan in the oven and bake 12 minutes. Carefully remove the parchment and weights and return the tart pan to the oven for 8 minutes. Remove from the oven and spread the mustard over the cooked crust. Scatter the grated cheese over the pastry, and arrange the tomato slices on top. Season with salt, pepper and the herbs de provence or herb mixture and return to the oven for 15 minutes, until tomatoes are “relaxed” and tart smells fabulous. Let cool for five minutes and then remove from the pan. Slice in wedges to serve. It’s totally irresistible warm. Wow, I have just eaten dinner and yet my mouth is watering. Already written the recipe down. You’re a gem for sharing! Sorry to have started the craving…but you will be very happy once you make it and get to eat it. 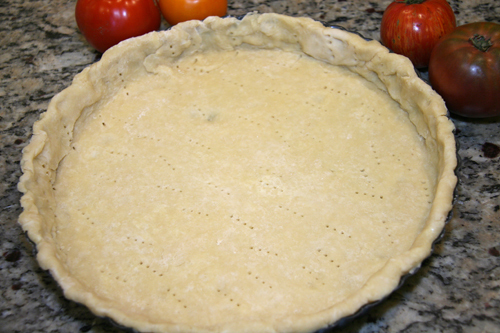 It’s a VERY easy tart…especially if you buy the pie crust ready to bake. Thank you for the nice compliment about my writing. I do love writing the posts as much as as I do the cooking and baking. Take care. Reblogged this on Yards To Grow Alliance. Thank you for reblogging this! How nice! I enjoyed reading your story that is attached to this delicious looking tart. Hi Colline. So nice to see you here and thank you for your sweet comments. That’s because there haven’t been almost any posts in the last few months. It’s not you…it’s me. Beautiful! 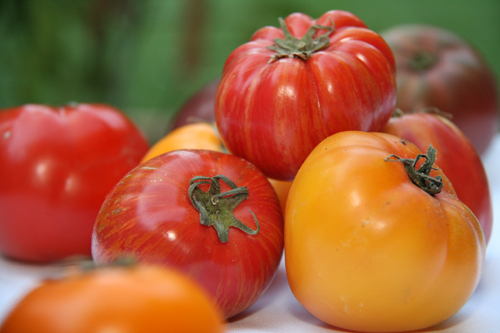 This will be a great homage to all the beautiful heirlooms once summer comes to a final close. Can’t wait to try it! I am too a fan of simple seasonal tarts! Your tomato tart looks splendid! Oh, so sad. Sorry Angie. They are fairly reasonable here at Trader Joe’s. You use regular tomatoes as well and you will be totally happy with the results. Thank you for the recipe, love it ❤ if u want, read my new tiramisu light recipe! I will absolutely do that next! Thank you for stopping by! Thanks CCU! Hope everything has been going great for you! Welcome back Geni! Your tart looks delicious. Thank you so much for the warm welcome. I’m sorry I have let my readers down lately, but I have totally lost my blogging mojo for the time being. If you see it, please return it to me. Take care! I bet this was as delicious as it looks. Oh and I am addicted to Trader Joe’s myself. Love it!!! The tomatoes were quite the beauties. Thanks for your kind comments. Sounds great, Geni, and your timing couldn’t be better. After weeks of wondering whether my tomatoes would ever ripen, they’ve all decided to ripen at once. I made jam yesterday and a tart or two sounds delicious. Thanks. 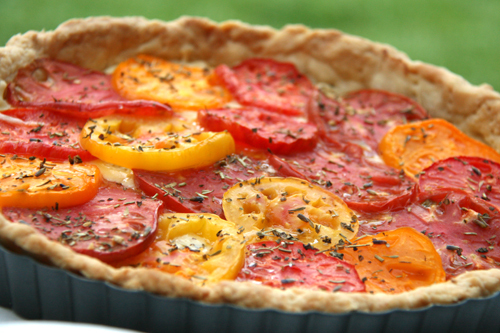 I know you will NOT be disappointed with this tart John and your tomatoes will do it proud. Thanks for checking in and commenting. I’m sooo happy to see you back! I’ve missed your wonderful style of writing! I’ve seen tomato tarts being made and eaten here and there, but have yet to make/try one! This looks easy enough, and crazy delicious! Thank you for missing me and checking in despite my disappearing act. Yes, I have been totally checked out of blogging. I seem to have lost my blogging mojo. Hopefully, I will find it once again. That is a great looking tart. I can see why it’s so popular. 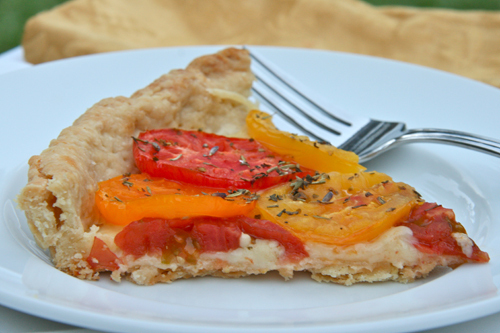 This tart looks perfect…love the juicy heirloom tomatoes with the Gruyere cheese…yum! Cannot wait to try this! It’s beautiful! Amazing combination of colours and flavours! Hello! This is one of my favorite summer recipe… I discovered it on a local cooking show a few years ago….II agree with you, everybody loves it. I have to say the mustard is a must! Nice blog and pictures! 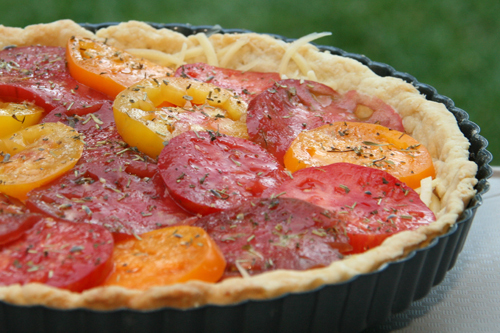 I don’t think there is anything better in the summer than a tomato tart. Yours is picture perfect! Hi Geni–Great to see you are still using this recipe! I think we are going to have a long tomato season this year, since we got a slow start. Enjoy the gorgeous heirlooms, and the tart! Thanks for mentioning Chez Cherie! Oh my gosh, I want such a tart – right now! I do hope you love it like I do. Let me know how it goes! Thanks for stopping by. I tried the recipe today for lunch and it is really jummy, althoug I usually don’t like mustard. I think you could skip any spread or brush on a little olive oil, one that has a flavor might be nice. You’ll have to let me know how it goes if you try it.